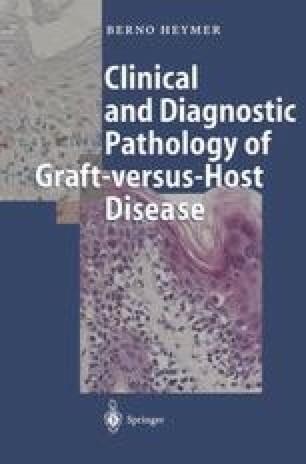 Graft-versus-host disease (GvHD) is the mirror image of allograft rejection. In GvHD not the graft but the host is rejected. This rejection is mediated by alloreactive donor T-lymphocytes recognizing minor or major histocompatibility antigens on target tissues of the host. GvHD primarily affects skin, liver, and gastrointestinal tract (GIT), but it can also involve other organs and tissues. The mortality of severe forms of acute GvHD can be very high, ranging from 50% to 90 % [ 139].